Thanks for being such an awesome trainer! I think about my original mistakes, and we are so much happier now. It's the time of year I always count my blessings, and this year I am so grateful for YOU and all you've done for Max (and Mike & me too!). We are in Phoenix right now and Max has been unbelievably sweet with new people and new dogs at the local dog park. I'm not sure if it has something to do with him being off-leash, but I was able to stand and chat with an older man WITH A HAT and 3 small dogs today. Max just sniffed and even tried to play with the Jack Russell/Doxie mix. What a nice feeling it was! Then tonight when I was helping cook dinner, I looked over to find Max sleeping on the lap of my daughter-in-laws grandma!! Max never met her! Anyway, I can't thank you enough for helping us out! We still need to work some more, and we'll join another of your classes this winter. 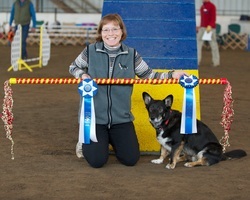 "I took your reactive dog class with Ellie over four years ago. I’ve told you already that it worked for us, but over four years ago, and it is still working for us today. Both dogs have been so much easier to manage. Of course they are both 11 now, but the truth is, they were very much in their prime and they were both difficult and stressful to walk. (I focused on the instigator – Ellie – first, and then worked with them separately until I could walk them together again. Not easy, of course, but definitely worth it.)" "Just last week I was stopped on a walk I was on with both dogs by a family who has been watching me, and they asked me if I was a dog trainer who could help them with their unfocused dog. I pointed them your way, and even if they never make it to your class, I decided today to thank you, again, for teaching the valuable classes that you do. Because of that class, my dogs and I have a better bond that is not only effective, but very positive. I love that I learned to work with my dogs in a way that didn’t work me up, or work them up. And I love that people notice. I’m looking forward to being in another class again someday when the need (and a new dog) arises."